What is the Midline of Your Body? Midline crossing is the ability to cross the imaginary midline of the body. This means the child spontaneously uses their right hand on the left-hand-side of their body and vice-versa. Midline crossing develops from bilateral integration and is a pre-cursor to the development of hand preference¹. How Does Midline Crossing Affect Handwriting? 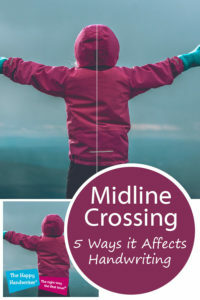 Once you have become aware of the different ways that midline crossing affects handwriting, you will start to be able to pick out these clever little adaptations our children use to avoid midline crossing. 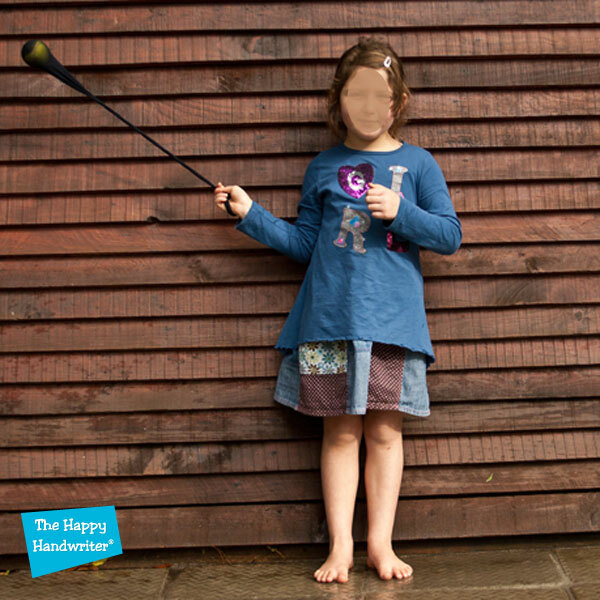 The most obvious manifestation of a midline crossing difficulty, is the child who has not developed a hand preference. They switch hands at the body midline, using their right hand on the right-hand-side, and their left, on the left-hand-side. I will always remember walking into a Grade 1 classroom and seeing a child who was colouring a tree. In his right hand he had a dark green twisty crayon, and in his left hand, a light green. And he switched hands as he coloured the leaves alternately in light and dark green. I always regret not having had the opportunity to take a photo of that! 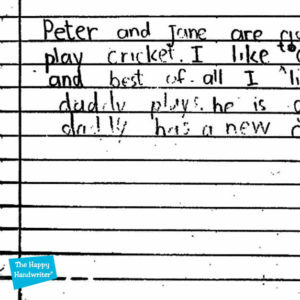 Grade 1 really is too late for the development of hand preference – children need to have this well in place but he time they get there. My take on this is that Grade R is the year of refinement in preparation for Grade 1. So, I would like the children to have ironed out any hand preference issues by that time. 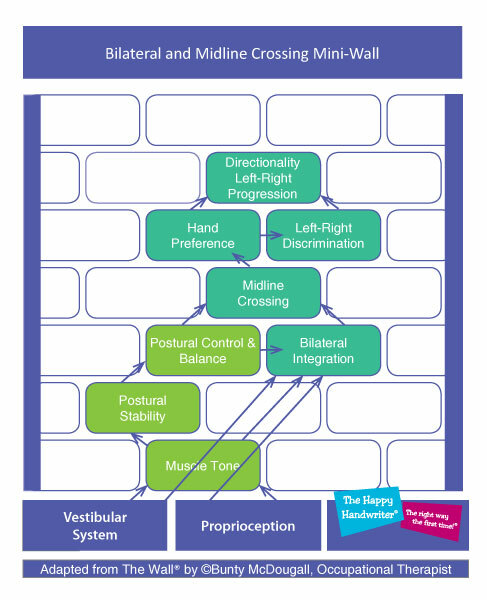 If we look at the developmental progression to hand preference starting with the foundations and adding the bricks one by one to get to the hand preference brick, we see that midline crossing is a foundation and stepping stone to the development of hand preference. And now we start to see that midline crossing, with its funny name, is kind of a big deal. Kid Sense also explores the importance of crossing the body midline. But the avoidance of midline crossing is not always as obvious as unestablished hand preference. Many of our midline children make adaptations while writing at their desks. You may notice they are doing something that looks a bit strange, but you somehow can’t quite put your finger on why they are doing it. Let’s explore how they compensate for midline crossing delays one by one. 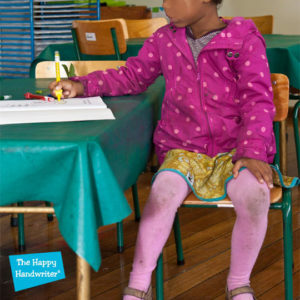 A right handed child may shift their book to the right-hand-side of their midline so they work on the right-hand-side without having to cross the midline. The same is true of the left hander, who shifts the book to the left. So, they avoid crossing their midline by working on the right-hand-side. And for many it works out OK. But for those who are sharing desk space, it becomes a big issue. Complaints that their book is in their friend’s space start to emerge. And without the understanding that this may be stemming from a midline crossing avoidance, they can look like they are just being obnoxious and getting in their friend’s space on purpose. One quick turn of the body, and our midline crossing avoidance is taken care of! 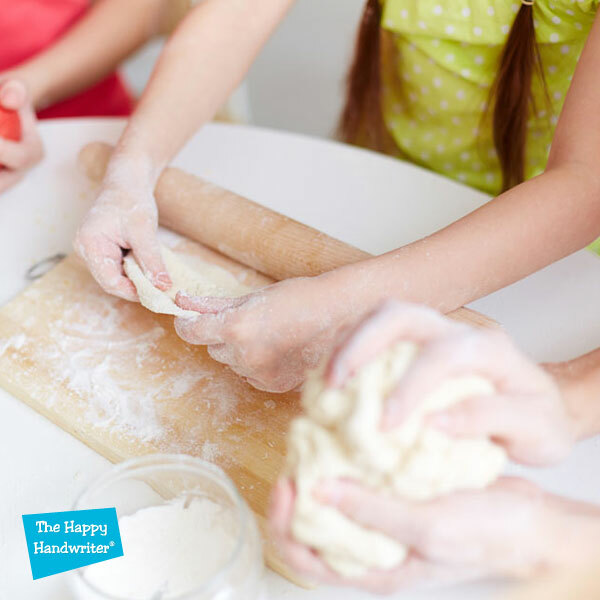 If children are turning side-on to the table there is usually a reason for it, and it may very well be in an attempt to avoid crossing the body midline. Rotating the book through 90° degrees so they write from the table edge upwards and not from left-to-write as typically developing children do. 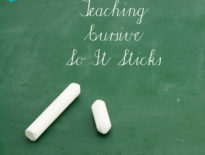 Our children learn that they need to start next to the margin. Their teachers have taught them to do so. 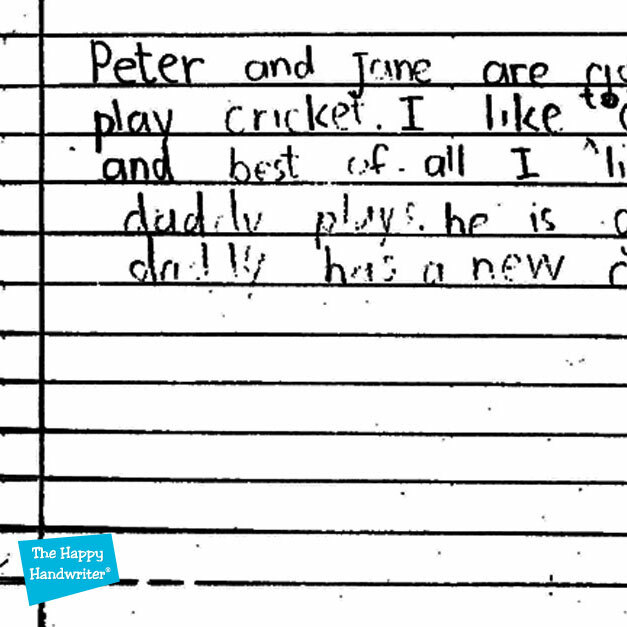 It is my experience that most children want to please their teachers. And so, they always try to start next to the margin. The one thing that we often don’t think about, is that in order to start against the margin, our children need to cross the midline. As they start out and think consciously about it, they start next to the midline. Their conscious thought over-rides their tendency to avoid crossing. But as their attention shifts to thinking about what they are writing, and not the writing process itself, they slowly drift away from the margin. How Can We Fix Midline Crossing Delays? The Wall is a guide and framework for occupational therapy students to understand the interconnections between the different perceptual-motor modalities. I have taken a thread out of The Wall, and just looked at the development of midline crossing. Here you can see that it has both postural and bilateral foundations. It also shows where midline crossing leads and how it is a critical foundation for the development of hand preference, or hand dominance, as some prefer to call it. Where trunk stability has not developed well for whatever reason, and the child is constantly slumping, it is difficult for the subtle rotation to develop while they are on their developmental journey. And this lack of subtle rotation can also affect midline crossing. When you are sitting and want to cross the midline, you subtly shift your weight and use a small rotational movement of the trunk. This is why it is a base for crossing the midline. Midline crossing also has its foundations in bilateral integration. So, we need to take a step back and look at that. Providing opportunities for engaging in activities that require the use of both sides of the body is going to promote the development of bilateral skills. 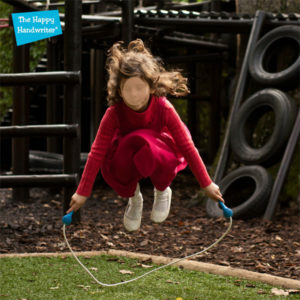 When it comes to developing bilateral integration skills, you can look at gross motor bilateral activities such as Ingle Angle, skipping, speedball, hopscotch and bike riding. Once your child has had a chance to explore those you can move to the bilateral hand skills which are moving closer towards the foundations your child will require for handwriting. Get into the kitchen and bake some cookies! And no, not with a food processor or an electric mixer! Mixing requires the co-operative use of both hands, as does beating with an egg beater. Rolling with a rolling pin is the next bilateral task. You can also roll cookies in balls and again, both hands have to help. Add some orange juice from a hand squeezed orange, and a little zest if you are up to the risks of the grater! (I never was and still think my adult children should be protected from the terrors of the grater!) Then, pop over to our Bilateral Hand Skills Activities and see what we have there. The challenge with developing midline crossing is that so often I feel the activities require a lot of external structure to achieve midline crossing. 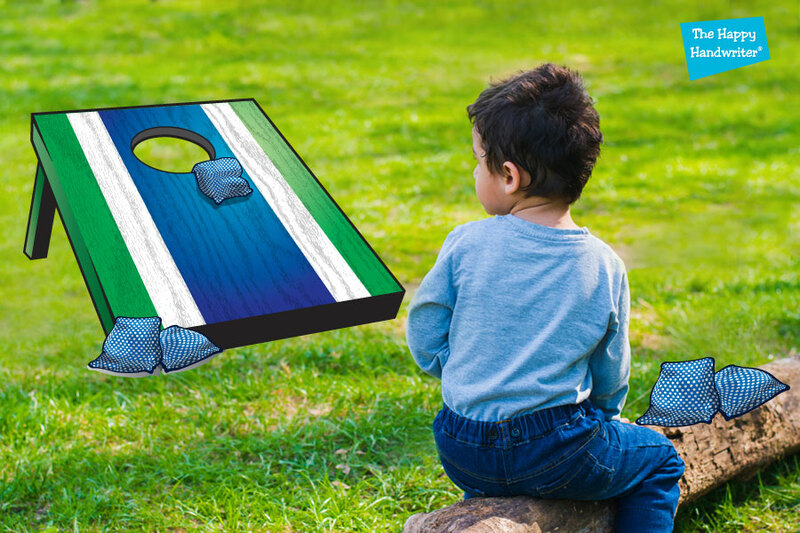 By this I mean that the materials, say for example some cards, are positioned on the left-hand-side (or right for the left handed child) which forces the child to cross to pick up the objects they require to complete the game. It is always my first prize that the movement required is inherent in the activity. The child mustn’t know we are trying to get them to cross. It must just be an inherent requirement of the activity. And these are some that are easy to do without fancy and expensive materials. This Ball in the Stocking game where the child smacks the ball on alternating sides is a winner when it comes to crossing the midline activities. 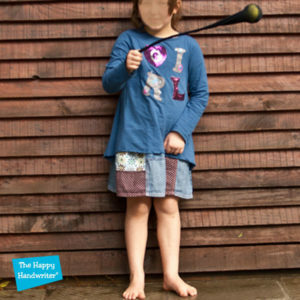 If you stabilise the child’s base by having them sit astride a log or anything else, you will be able to promote midline crossing. If they stand, or walk around and do the activity it is not going to work in the same way because they can just avoid midline crossing. Use this seated position for blowing bubbles, throwing objects or catching a ball. And then there is cleaning. . . ! 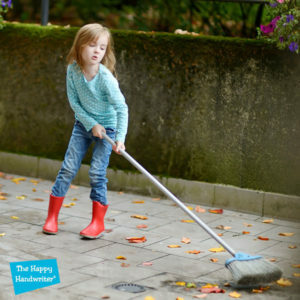 Sweeping with a broom, or a dust pan and broom are going to require midline crossing. 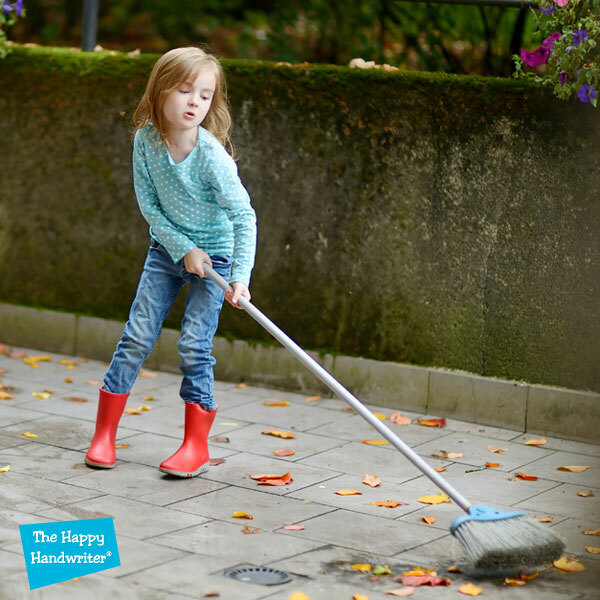 It doesn’t have to be the real cleaning deal – let them sweep up lego, or other fun objects. And no midline crossing activity list would be complete without the paint roller! Time to wash those walls! And then there is flossing! Children engage when they are having fun. And I always say children improve when they are having fun. Learn to floss! 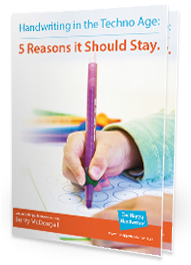 Should your child continue to struggle, it may be wise to consult an occupational therapist. They have a host of wonderful suspended equipment which has the potential to work on all these areas. 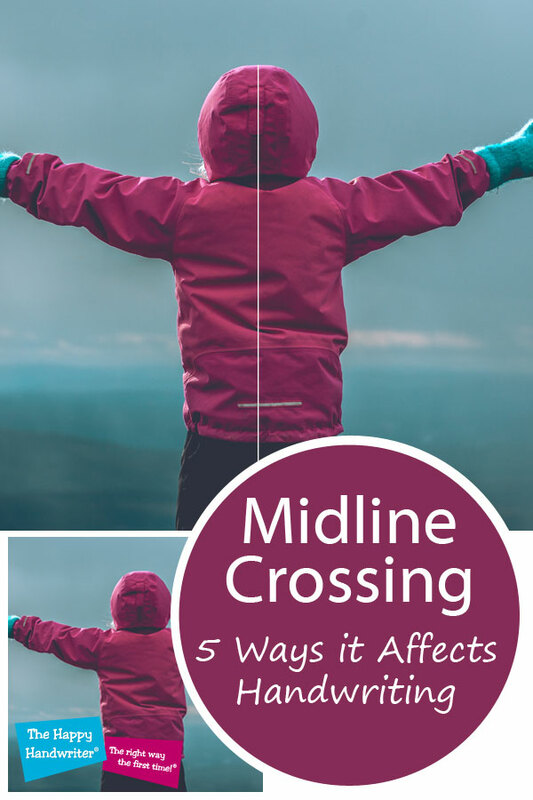 I do hope that this piece has answered the question about what is midline crossing, how it affects our children’s handwriting and how we can help them with it.